Mabamba Wetland Shoebill Watching tours: One of the main reasons for coming to Nkima Forest Lodge is to see the rare Shoebill Stork in its natural environment in the wetlands. The local community organise boat tours with expert guides to see the Shoebill as well as other wetland bird species. These trips are popular both with birders and non-birders, and give a unique opportunity to experience the natural wetlands environment. 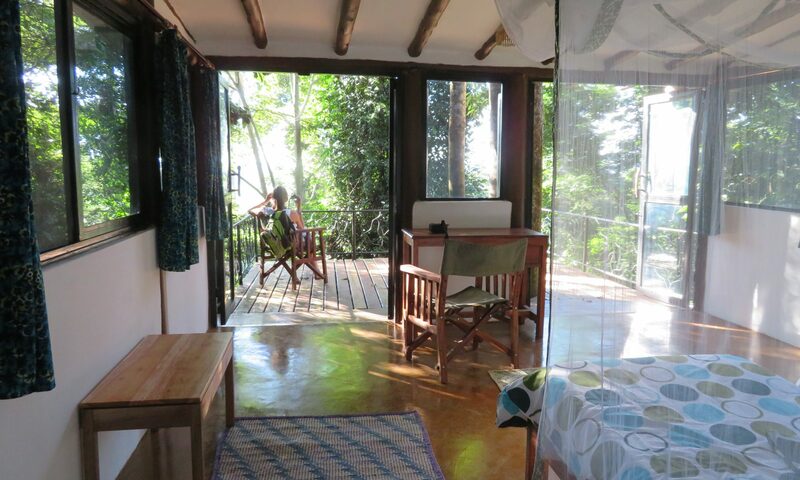 By staying at the lodge you will be able to arrive at the Mabamba landing site in the early morning , which is the best time for seeing the shoebill and other birdlife. Bird watching: There are over 140 species of birds that have been seen from the lodge. We maintain a bird list for visitors. 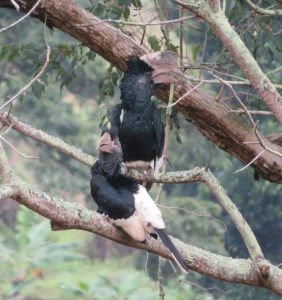 Non birders will enjoy the noisy large Black and white casque hornbills, western banded snake eagles, the Great Blue Turacos, African grey parrots and the Pied hornbills. Specialist birders can look out for the White spotted fluff tail, the Vanga flycatcher, the whistling cisticola, the Snowy headed robin chat, the Western nicator and the red-bellied paradise fly catcher. The owner is knowledgeable about the birdlife in the area and we can arrange specialist bird guides on request. Walks: There are a number of short and longer walks that can be taken directly from the lodge. 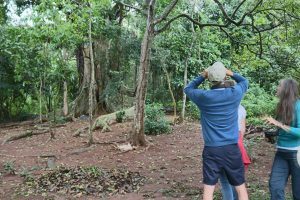 A perimeter walk around the property takes you through the forest and includes a visit to an old fig tree, of spiritual significance to the Mabamba clan, one of the many clans that make up the Baganda, the largest ethnic group in Uganda. There is a short walk along the top of the hill, which leads to a viewpoint with great views of the Mbamba wetlands to the west, Bussi Island to the south and Entebbe to the east. Longer walks can be arranged to Mabamba village and along the forested edge of the wetlands below the lodge. We offer guided walks for residents on request. Cycling: The lodge has 6 mountain bikes for hire by guests (20$US for half day cycle hire). There are numerous cycling routes in the area including a shorter circuit of the surrounding area below the hill, or longer trips on Bussi island, which can be reached on a short boat ride and has excellent tracks for cycling with very few vehicles, or towards Kasanje through the nearby villages. Canoes: We have two canoes available for hire for paddling along the channels in the wetlands. Shoebill Adventure Park: This nearby attraction on Bussi Island can be reached by boat from the Mabamba landing site (or by boat and cycling). The Park offers an aerial rope adventure challenge with 3 levels of difficulty all ending in a zip line down to a sandy beach. Games: The lodge has a large selection of board and card games available for residents as well as croquet and boules/bocce. Butterfly catching: Children love to try their skills at catching and identifying the many butterflies on the hill with small nets provided by the lodge. They are of course released after identification. 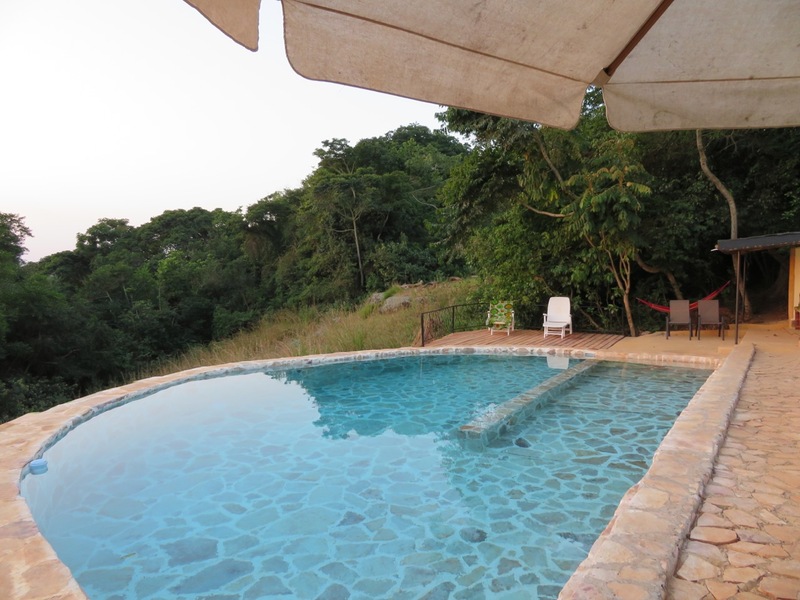 Mpanga Forest: The protected Mpanga Forest Eco-tourism site is a 30 minute drive from the lodge and offers great forest walks or cycling in beautiful rainforest.